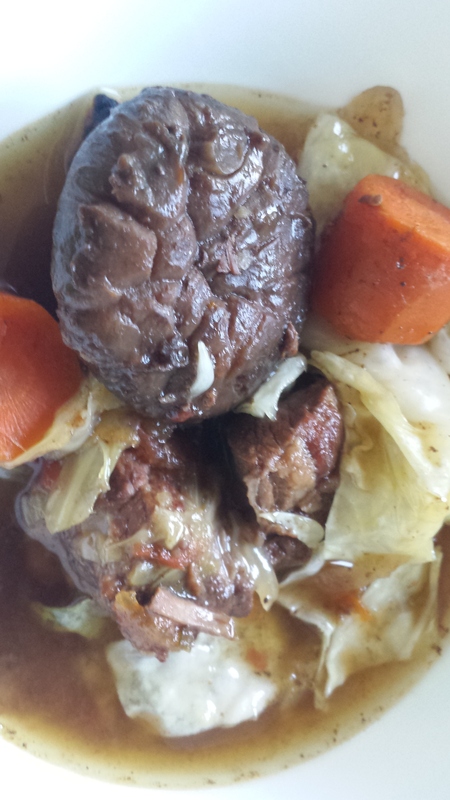 While I rarely delight in beef, the boys really enjoy stew. The weather is just barely turning cool in our area, so after scratching my head for recipe inspiration, I figured it is that time of year for stew. For the less-beef-minded in our family (Claire and me), I threw in a healthy amount of shiitake and cremini mushrooms for a similar “meatiness” and a half a head of sweet cabbage, cooked al dente. Serve alongside some bread for dipping, it is something the entire family can warm up around. Sprinkle flour over meat. Season with salt and pepper. Toss to coat. Drizzle olive oil in heavy pot. Sear meat over high heat in batches; remove to a plate when brown. Add onions and garlic to pan (without cleaning); saute for 2 minutes over medium-low heat. Add mushrooms and carrots and cook for 2 minutes. Pour in wine and stock. Add salt and pepper to taste, and stir. Bring to a boil, then add back into the mix the browned meat. Reduce heat to low. Add thyme sprigs to pot. Cook and simmer for 30 to 45 minutes. After that time, mix 2 tablespoons flour with a little water and pour into the stew. Allow to cook and thicken for ten more minutes. In the last few minutes, add cabbage. Serve with bread, pasta or rice. Note: You can easily cook this is a slow-cooked. Sear the meat and vegetables, then place in slow cooker. Cover with wine and stock (maybe some water so that the meat is submerged). Cook for 4-6 hours. In the last 5-10 minutes add cabbage. Heat a large nonstick skillet coated with a couple tsp olive oil over medium-high heat. Cook ground beef until cooked thoroughly. Add broccoli and cook for 3-4 minutes, until tender but crisp. Add carrot and garlic, saute 2 minutes. Combine soy sauce, sake, and honey in a small bowl, stir with a whisk. 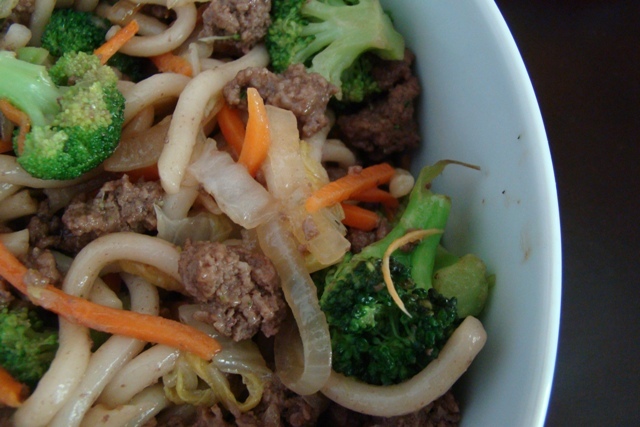 Stir in soy sauce mixture with the vegetables, cook 2 minutes, stirring constantly. Stir in noodles and broth. Cook noodles 3-4 minutes, until al dente. Top with green onion or sesame seeds, if desired. Serve immediately. East meets West in this carb lovers dream. My favorite potato combined with FHE’s favorite rice. 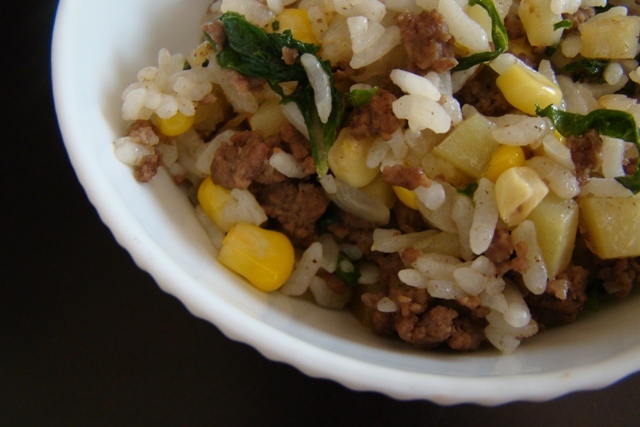 The textural combination is a dream – starchy new potatoes and luscious kernels of white rice. I’ve spiked our creation with beef for protein, onions, fresh shucked corn and finely chopped baby kale. With a touch of a ginger and garlic, the fresh vegetables add a surprisingly light touch to this flavorful dish. I wouldn’t ordinarily think to combine cinnamon, one of my favorite spices that I liberally sprinkle into my daily bowl of oatmeal, and beef. But it works. Really well. Almost in a moussaka-like way. 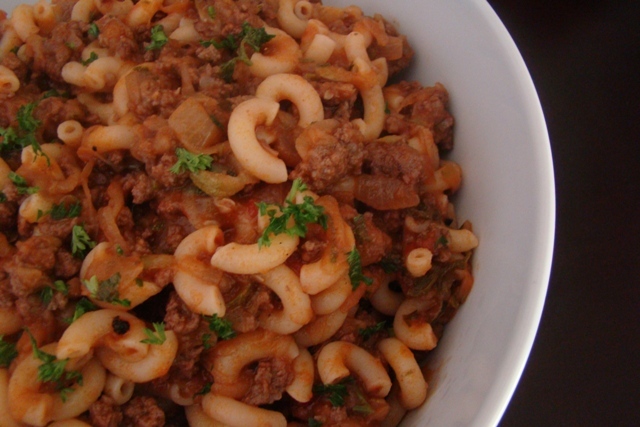 Warm and hearty, this is the type of comfort dish that is perfect for Fall weather. 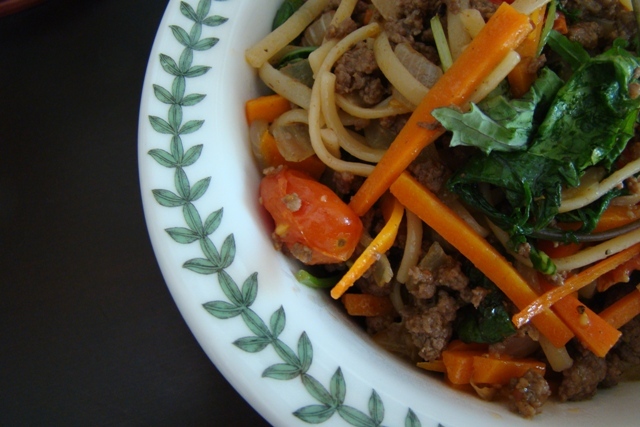 Cook beef in a large nonstick skillet over medium-high heat 3 minutes or until browned, stirring to crumble. Stir in spices and tomatoes. Add carrots and kale and cook until tender. Serve immediately. We are, as expected, full of squash. With a few yellow squash from a neighbor mixed in with our zucchini, some onions and shredded carrots, this pasta is brimming with veggies – even if the naked eye cannot detect them. You would think this would be perfect to fool veggie-abhoring children, except Rice Kernel prefers to be vegetarian still so that wasn’t my purpose in delivering this dish. Instead, FHE abhorbs squash. So what better way to celebrate summer’s bounty than with the help of a box grater! In a deep, medium-sized pan, saute onions until translucent. Add meat and cook until thoroughly cooked through (if using). Add squash and carrots. Cook 1-2 minutes, then add herbs and tomato sauce. Simmer for 10 minutes. While sauce is simmering, cook pasta according to directions. Drain and pour into sauce to combine. FHE used to love Hot Pockets from the freezer section (Lean Pockets is what we actually bought). Simple and savory, I remember years of storing the tiny packages in our freezer for a last-minute bite in the morning and a post-soccer game snack at 11 p.m. It has been years since we’ve purchased them, mostly because they aren’t the most wholesome food choice. (FHE’s words, not mine.) But that doesn’t mean we don’t enjoy them. With fresh pizza dough aplenty at the grocery store, homemade versions can come together quickly. This is also a project perfect for little fingers. 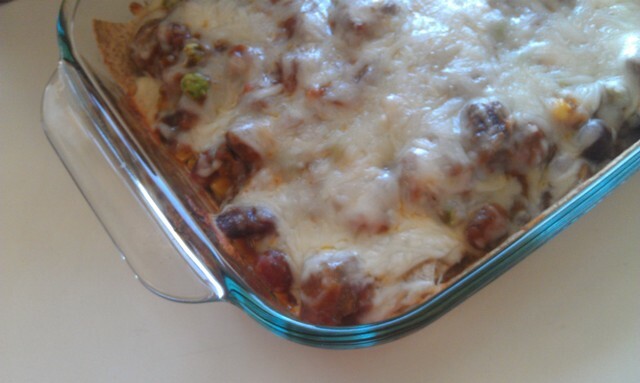 For my mostly-vegetarian son, this means a little cheese and lots of broccoli. He’s recently (finally) discovered a love of pepperoni so that was on our menu as well today. 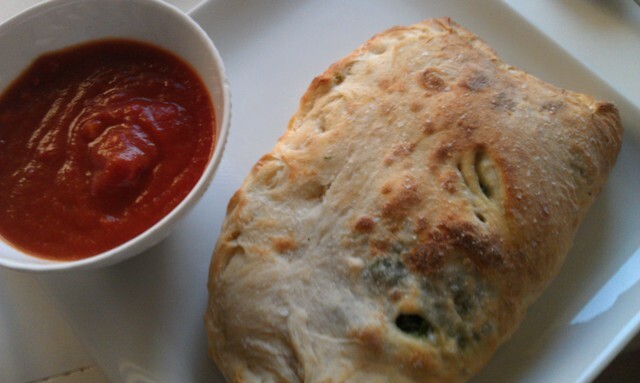 Poke small holes in the top of your calzone so steam can escape and you don’t develop too many air pockets inside. Be sure to seal the edges really well, otherwise you will have a big mess. Brush the top of the calzone with olive oil or eggwash before you put it in the oven for a golden finish.